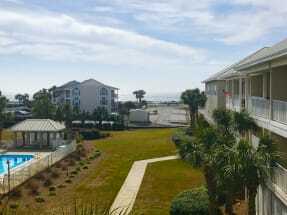 Welcome to our Vacation Condo Rentals at Pavilion Palms, Destin Florida! 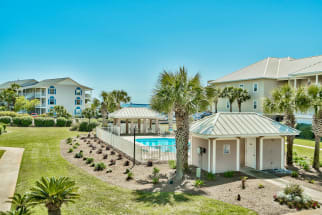 Emerald Coast by Owner is proud to offer you a large selection of gorgeous vacation rental condos equipped with many amenities for your benefit. This low rise complex features 30 larger condos with gulf views, a centrally located seasonally heated pool and a short walk to the beach. Outside of your condo, you can relax on the beach, lounge out on your balcony, or go to a local spa. If you want to be up and moving when you stay here, you can enjoy many of the popular attractions down here! Some of the most common places to visit include Henderson State Park for its private beaches and scenery, and Big Kahuna's Water Park for its fun rides and slides for everyone! Now aside from all that, the food is amazing down here. We love seafood, and Destin's the perfect place for it! Some delicious eats we highly recommend you try would be a meal at Pompano Joe's and a meal at Dewey Destin's Seafood and Restaurant. They both have great service, food, and views of the coast. 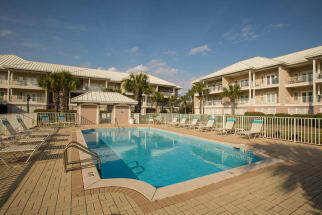 Emerald Coast by Owner is pleased to offer vacation rental condos in the beautiful Pavilion Palms. Scroll down now to view our different listings! When you book with Emerald Coast by Owner, we put you in direct contact with our property owners. Booking direct with the owner is the best way to assure that you are not paying any unnecessary fees. Contact our Pavilion Palms owners with any questions and be sure to book online today!